Feeling sick today, so this will be a quick one. 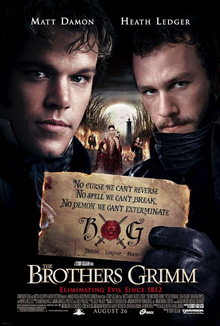 Today I watched The Brothers Grimm. This movie has the rare distinction of being a completed Terry Gilliam movie. And right from the get-go it’s told to us in no uncertain terms, that this movie is a fairytale, a gothic, beautiful, funny fairytale. So don’t ask why this guy is cartoonishly evil, don’t ask how we have all these anochronistic inventions, don’t ask how a kiss can cure multiple puncture wounds. No. That’s not what this movie is for. This is for Matt Damon and Jude Law playing a Croby/Hope comedy team next to a swanning evil Johnathon Pryce. My only annoyance was that there was (yet again) another shoehorned love interest with no real chemistry or reason to like either of the main characters and whose sole purpose was to be a hostage in need of rescuing or a kamikaze in need of talking down. At least they twisted the ending a bit concerning her. Anyways. Great movie. Great fun. I’m going to bed now.